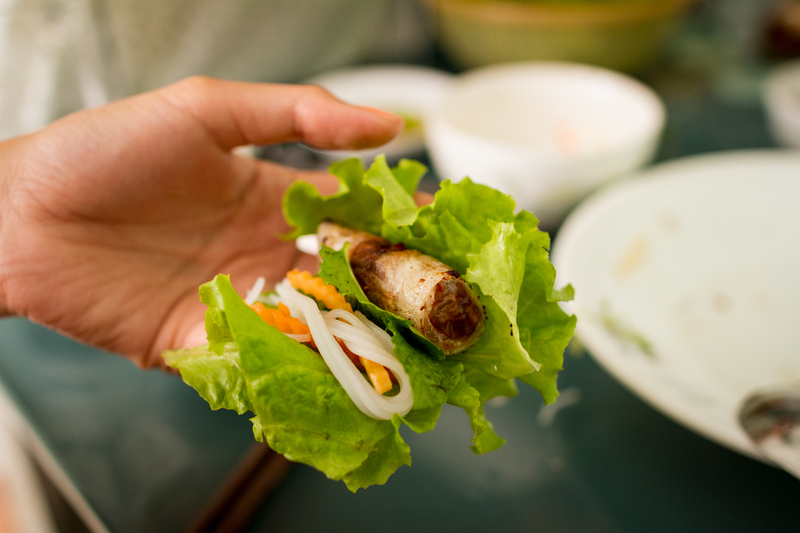 This Vietnamese delicacy is traditionally served with Romaine lettuce leaves and fresh Basil, Mint or Cilantro leaves. The cool crisp lettuce and herbs are then wrapped around the hot and crispy rolls and then dipped into a spicy, sweet, savory and tart fish sauce called Nước chấm. … an unbeatable combination! This recipe makes around 30 – 35 cigar sized rolls. We serve this as a main course, but is usually just an appetizer. Not a “Spring Roll” or an “Egg Roll”, this is something uniquely different and far tastier. Requires Vietnamese Fish Sauce condiment - Nước chấm for dipping. 2 carrots finely minced, if the minced carrots appear very wet, blot dry! 6 dried Shitake or “Tree Ear” mushrooms soaked in warm water for 15 minutes or so and then finely sliced into very thin strips. 1/2 package of bean thread or cellophane noodles - around 2 ounces - soak along with the mushrooms. 2 Heads of Romaine lettuce washed and separated into individual leaves that will roll easily - if the white end is too hard to roll then cut off a little. It may take three heads of Romaine to end up with enough large leaves suitable for wrapping. 1 Bunch of fresh Cilantro - remove the biggest stems if you wish - it doesn’t seem to matter much around here. (A miniature food processor is just the ticket for this dish - just the right texture for the onion and carrot). Drain the softened bean thread noodles well and roughly chop into 2 inch lengths. In a large mixing bowl, add all the ingredients and mix well. Fill a wide shallow mixing bowl or baking dish with warm water and dip the rice paper wrappers in the water one at a time or they will get too soft. Spread the softened, and wet, rice paper wrapper out on the counter and place two heaping spoonfuls near the bottom of the wrapper. Roll the bottom edge over the filling and roll another half turn and fold the sides over the filling and continue rolling tightly into a cigar shaped roll. Deep fry a few at a time in 350° oil. Place rolls in hot Peanut oil one at a time about one minute apart as the rice paper wrappers have a tendency to stick to each other. Fry until lightly golden brown. Drain on a rack and keep warm in the oven until the rest are cooked.